Nueva Esparta State flag has three bands, which get thin as the approach the bottom of the flag (like Colombia's flag, or Miranda's 1810 tricolory). The first band, yellow, represents the rices of the islands, and the light of its people (???). A third of a circle begins to show above the horizon line of this yellow stripe, in white, representing alternatively a sun and the ancient pearl trade which made these islands famous centuries back. Such remembrance stirs the patriotic fire of the inhabitants of the three islands which conform the state (Margarita, Coche y Cubagua), represented by three equidistant, white, five-pointed stars of the second stripe, in blue (colour of the sea). Green, which is the colour of hope and fertility, reminds us both of Continental Venezuela and of the islands themselve, and their link with the rest of the country. Source: 1981 edition of "Los Simbolos Sagrados de la Nacion Venezolana", by Francisco A. Vargas. Guillermo Aveledo reported as yellow-BLUE-GREEN flag. However <www.gobiernoenlinea.ve> show yellow-GREEN-BLUE flag. The Flag of Nueva Esparte State, composed by the islands of Margarita, Coche and Cubagua, located to the East of Venezuela in front the coasts of Sucre State, is a field horizontally divided in three stripes: yellow, blue and green with a white semicircle off-centered to fly and three white five-pointed stars on the blue stripe. The image above is correct. Here is a complete report about the Flag and Coat of Arms of Nueva Esparta State, possible thanks to the cooperation of the Direction of Culture of this Venezuelan federal entity which it have the kindness to send recently to us official data about the matter. The Flag - Attributes and Meaning: Nueva Esparta is the unique insular Venezuelan State and is located at the East of the Republic in front of the coast of Sucre State. Its flag, rectangular with ratio 2:3 is divided in three horizontal stripes: the superior one is yellow and occupies 1/2 part of the field, remember the tropical sky and charges a white half circle off-centered to the fly which symbolizes the Unity and the Purity of the Neospartan region. The central fringe, in green, is half width of the yellow one, represents the life, the vegetation and the ground and shows three five-pointed and white stars which symbolizes the Islands of Margarita, Coche and Cubagua that conform Nueva Esparta State. The inferior stripe, in blue, occupies the rest of the field and represent the Caribbean Sea. Historical Synthesis: The flag was created by Mr. JUAN CARLOS VELAZ and was established by means of Decree Nº 816 emitted on August 7th, 1998. Sources: "Flag of Nueva Esparta State" (Feuilleton), Juan Carlos Velaz, La Asunción, Margarita, 1998. Posted by Direction of Culture of Nueva Esparta State with date August 11th, 1999. I located Nueva Esparta state Coat of Arms at <a-venezuela.com> together with state-hymn and state-tree. The Coat of Arms - Attributes: Field of compound shape quarterly per fess with the line of contour in Or. The quarter of the Chief or Superior, enameled in Gules (red) loads a boat called "flechera" (something like "arrow boat") carrying seven men and showing a little flag on the stern, all over an Argent sea. The quarter of the Base or Inferior, enameled in Azure (blue) charges a pearl collar with twenty-five pieces. As external ornaments the Coat of Arms shows a lance crowned with a Phrygian Cap in the middle of a aureola and surrounded with a laurel crown as crest; a trident and a oar disposed in saltire back the field; a coral branch at the dexter and a sea-weed at the sinister jointed in the Base by means of an anchor with a triton fish as supports. Semiology: The enamels of the Coat of Arms and its contour recall the National Flag of Venezuela. The quarter of the Chief remember the legendary courage of the Neospartan people and their contribution to the National Emancipation. The quarter of the Base symbolizes the insularity of the State and the pearls: one of its antique and most important products. The Phrygian Cap alludes to the Freedom. The laurel crown remember the glorious triumph which Neospartan patriots obtains in the Venezuelan War of Independence. 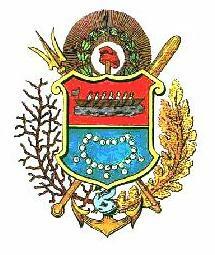 The trident, the oar, the coral and sea-weed branches, the triton fish and the anchor symbolizes the deep maritime vocation and entail of Nueva Esparta State. Historical Synthesis: Created by Dr. JUAN MANUEL VELÁSQUEZ LEVEL on 1876, it was established as special Coat of Arms of the State by means of Decree emitted on October 20th, 1917, signed by General JUAN ALBERTO RAMÍREZ, Constitutional President of Nueva Esparta at the time.